Some wine estates have had our support since we moved to the Helderberg in 2001. Eikendal has been one of them. I just love their Brut Rosé and bought cases at a time. Then, at the beginning of 2010 I went to top up and was told “sorry, we no longer make this”. The lady who I always get my stock from told me she would call me if they got any in. So, I waited – and shopped elsewhere for the pink bubbly I love. In October of 2010 my friend Chantelle told me that Eikendal were having a competition for the Helderberg Wine Festival. Everyone who purchased a bottle of wine / bubbly would be entitled to enter their competition to win a night at the lodge. The Saturday of the festival, Chantelle called to tell me she had a case of pink bubbly for me 🙂 They had ‘found’ some. Not to miss out on all the stock they have on the Sunday we made a stop at Eikendal. We entered the competition to win a night at the lodge and tasted some wine. While trying to make a purchase, we were ‘pushed aside’ while 3 other people were dealt with. I waited patiently for what should have been my turn first in order to ask whether there was anymore pink bubbly to be told “sorry, your friend took the last ones”. How on earth she knew Chantelle was my friend is beyond me. She did however offer to call me if anymore came in, and so I left her my details. There was another competition running – spend R550 and stand a chance to win 6 bottles of their flagship wines. So, I spent over R550 and put my name in the draw. taking this to be a typo: Andy instead of Tandy, I drove back to Eikendal on Wednesday to collect my winnings. The same lady told me no, this email does not mean you won it was sent to all the entries – WTF? (sorry, I need to use this type of language here). How can you send a group email of this nature? So, to say sorry for the inconvenience I was given a bottle of …..
yup, you guessed it right! Brut Rosé. The same item they supposedly had none left of. Now, my first disappointment is obviously not winning the competition, but the second disappointment is that I was told an untruth (lie being such a strong word). There is more of the Brut Rosé – and I would have bought all of it given the opportunity. I have been saving this bubbly for special occasions and a few weeks ago, the occasion arose. I opened the bottle, and it was flat. I was so disappointed but in order to make sure it was not wasted I capped the bottle and set it aside to use in my kitchen. 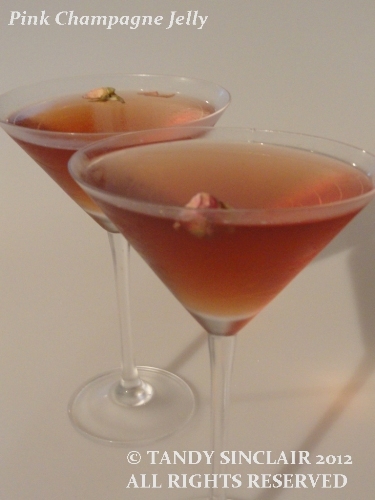 I remember seeing a recipe for jelly that used pink champagne in the Taste magazine, and so I decided to use it for that. If you are still finding your inbox inundated with comments, or want to know how to turn off the option, please click here to read Sharp Little Pencil’s solution. I love the fact that you made the most of this situation and turned a negative experience into a beautiful dessert. This looks both refreshing and delicious. Perfect! Tandy, thanks for stopping by my blog and I see that silly box is there, but it is NOT auto-checked, so your subscribers can choose to see follow-ups. Best of both worlds, and good on you. Andy, this looks wonderful. Just couldn’t resist. Let me know how it works please! I cannot imagine ever using a box jelly again! Tandy, it looks gorgeous 🙂 So nice to have you back! Now: a rather ignorant question: do the bubbles have any effect on the jelly? Great!! Perfect for a romantic supper! It is sad when the local companies don’t see fit to support their local supporters! When I saw the blog header I found myself thinking…maybe I´d rather just drink the champagne but now I see why you made it and I bet it was gorgeous! What a bizarre way for the winery to treat clients though. WTF indeed! oooh yum yum, ar0e the rose buds those beautiful ones that open when you add the hot water? if so where do you get yours?